The Best Study Abroad blogs from thousands of top Study Abroad blogs in our index using search and social metrics. Data will be refreshed once a week. Also check out Study Abroad Podcasts and Study Abroad Youtube Channels. 2.33 USAC - Your Gateway to the World! Study Abroad newsletter is a comprehensive summary of the day's most important blog posts and news articles from the best Study Abroad websites on the web, and delivered to your email inbox each morning. To subscribe, simply provide us with your email address. India About Blog EDWISE is a pioneer in the field of GLOBAL EDUCATION & India's Leading Overseas Consultants is THE ONE stop solution for all your international education needs. Facebook fans 481,520. Twitter followers 1,168. About Blog On the GoAbroad Blog you will find resources, articles, and advice related to every type of meaningful travel. Whether you're preparing to study abroad for the first time or moving abroad for a new job, the GoAbroad Blog is here to bring you the lastest information and updates related to educational travel. Facebook fans 106,022. Twitter followers 31,520. About Blog Info/tips for anyone that is planning to study abroad. Hyderabad About Blog Get the latest and most useful updates on overseas careers, immigration, travel and visas here. - Y-Axis Overseas Careers is India's most trusted International Recruitment and Immigration Consultant, since 1999. Facebook fans 174,658. Twitter followers 1,249. Barcelona, Spain About Blog TheStudyAbroadPortal.com is the leading go-to place for students all over the world looking to study abroad. The portal offers information about interesting study abroad programmes, free live and recorded informative study abroad webinars (online open days) and a lot of tips and tricks to studying abroad. Facebook fans 83,628. Twitter followers 690. About Blog Your No. 1 Study Abroad & Scholarship Blog. Study-domain.com is designed to assist students from low income background study abroad in low and free tuition universities. Since it’s creation in 2012 over 800 articles which focus on low and free tuition universities in Europe, US, Canada and free scholarships have been published. Facebook fans 17,824. Twitter followers 170. Facebook fans 5,127. Twitter followers 70. Iowa City, IA About Blog Blog by University Of Iowa International. At the University of Iowa, International Programs functions as a catalyst for internationalization and a hub for international activities. Facebook fans 1,649. Twitter followers 892. Newark, DE, USA About Blog Blog by Univ. of Delaware. From its roots as a private academy in 1743, the institution today is a research-intensive, technologically advanced university with global impact. Facebook fans 74,776. Twitter followers 41,880. Leicester About Blog Student blogs written by current University of Leicester undergraduate, postgrad and distance learning students. Find out about this leading university and see what makes it a leader in student satisfaction. Blogs on Bio Sciences, Economics, English History, Law, Psychology and more. Facebook fans 43,297. Twitter followers 8,660. University of Southampton About Blog Blog by University of Southampton dedicated to displaying student and staff feedback about their experience overseas. The University of Southampton is in the top 1% of universities worldwide. They are global centre for excellence in research and education. Facebook fans 1,399. Twitter followers 519. Kansas City, Missouri About Blog Blog by University Of Missouri- Kansas City (UMKC). The UMKC, one of four University of Missouri campuses, is a public university serving more than 14,000 undergraduate, graduate and professional students. Facebook fans 31,635. Twitter followers 11,917. Bellingham, WA About Blog Blog by Western Washington University (WWU). With 15,000 students, 160 academic programs, and an energized campus community, Western offers the focus on students and the faculty access of a smaller college and the academic choice, resources, multicultural diversity, and room to grow of a large university. Facebook fans 46,122. Twitter followers 19,763. Sweden About Blog Study in Sweden is a comprehensive, official resource on studying in Sweden for prospective and current international students. Here you'll find everything you need to know on the Swedish higher education system, finding and applying for a programme, searching for scholarships, living as an international student in Sweden and learning Swedish. Facebook fans 396,421. Twitter followers n/a. Glenside, PA About Blog Study abroad through Arcadia University for academic and experiential programs that match your personal and academic goals. Facebook fans 3,227. Twitter followers 2,828. Valparaiso Indiana About Blog Valparaiso University Student stories from around the world. Valparaiso University is a private, independent Lutheran university located just one hour southeast of Chicago and two and one-half hours north of Indianapolis. Facebook fans 19,134. Twitter followers 7,106. Holland, Michigan About Blog Hope College Off Campus Study/Study Abroad mission is to integrate the perspectives of international students and scholars into the campus community, to provide off-campus study opportunities for all students, and to stimulate conversation surrounding cross-cultural and global issues, all of which contribute to the internationalization of the Hope College campus. Facebook fans 1,009. Twitter followers 9,781. Dublin About Blog Find out about studying abroad in Ireland from the Education in Ireland's international Student Ambassadors Blog. It's full of student experiences. Facebook fans 540,812. Twitter followers 151,991. Stamford, CT About Blog Blog by American Institute for Foreign Study (AIFS). Since 1964, more than 1.5 million students have changed the way they see their world by studying abroad with the AIFS, one of the oldest, largest and most trusted cultural exchange organizations in the world. Facebook fans 26,700. Twitter followers 6,202. About Blog Abbey Road Summer Programs programs for high school students offer many different options to choose from. Choose your summer program in France, Italy, Spain, Germany, Greece and in the U.S.
Facebook fans 3,236. Twitter followers 504. About Blog Scholarship and application information for international students studying around the world! Facebook fans 1,665. Twitter followers 12. Boston, MA About Blog This blog will focus on CAPA's global cities and the field of international education generally. Facebook fans 3,999. Twitter followers 2,991. About Blog I want to first welcome you to Study Awake USA. The purpose of this website is to help thousands of students around the world searching for a professional admission counselor to work with. I have been tested and trusted over the years by the Universities I represent as a genuine admission counselor. India About Blog Online Macha is a free help site & discussion forum for students and study abroad aspirants. Ask and answer questions just about anything related to higher studies. Share and Discuss your views by Visiting our free help site and Explore Study, Scholarship programs in US and Germany. Facebook fans 2,086. Twitter followers 1. Washington, DC About Blog Study Abroad with CET Academic Programs. CET offers semester and summer study abroad programs in Argentina, Brazil, China, the Czech Republic, India, Italy, Japan, Jordan,Taiwan and Vietnam. Facebook fans 2,467. Twitter followers 993. Worldwide About Blog The ISA Blog Team strives to facilitate critical reflection and learning by utilizing the ISA Discovery Model via the ISA Student Blog. Each semester, the ISA Blog Team creates new and innovative blog prompts to spark ISA Featured Bloggers interest to write blog posts that reflect on the ISA areas of discovery. Facebook fans n/a. Twitter followers 16,195. Austin, TX About Blog Information and links from the API abroad blog focusing on study abroad programs, intern, teach, work, volunteer, and service projects abroad. Facebook fans 24,323. Twitter followers 10,971. New Delhi, India About Blog Visa House Immigration Consultants can ensure that your Study Visa & immigration dreams to countries like Study in USA, Immigration to Canada are realized. Read all the information about Study Abroad, Immigration, Internship and Visa Consultant procedures, and their immigration office assistance on visa house. Facebook fans 22,710. Twitter followers 3,561. Copenhagen & Stockholm About Blog DIS - Study Abroad in Scandinavia. DIS is a non-profit study abroad foundation established in Denmark in 1959, with locations in Copenhagen and Stockholm. Facebook fans 13,532. Twitter followers 3,187. Pittsburgh, PA About Blog Athena Study Abroad puts a personalized and customized focus on study abroad.Athena Study Abroad was developed in an effort to bring students authentic study abroad experiences involving true, cultural immersion, designed by knowledgeable, caring professionals. Facebook fans 5,684. Twitter followers 2,097. Bengaluru, India About Blog Plusprep's free Study Abroad Blogs & Tips help you to understand the process of applying to universities abroad and also offers information on GRE, GMAT, SAT, IELTS, PTE and more. We specialize in Quality Test Preparation & Admissions Consulting. Facebook fans 2,332. Twitter followers 5. 33. USAC - Your Gateway to the World! About Blog Discover affordable, quality study abroad programs with USAC. Facebook fans 8,630. Twitter followers 3,791. Newport, Rhode Island About Blog Blog by Salve Regina University. Located on a picturesque campus in the historic city of Newport, R.I., Salve Regina University is a Catholic, coeducational university founded by the Sisters of Mercy. The University offers a comprehensive education with a liberal arts foundation that fosters the development of each student’s individual talents. Facebook fans 572. Twitter followers 194. Scottsdale, AZ, USA About Blog Blog posts from IBS Staff and Alumni regarding their own travel experiences on a variety of Short-Term Study Abroad Seminars to Europe, Asia and more! Facebook fans 1,564. Twitter followers 1,175. Chestnut Hill, MA About Blog Explore the BCSA site for the latest programs, resources and news for BC students studying abroad. The British Columbia Study Abroad (BCSA) Consortium is a group of BC post-secondary institutions that work together to encourage students to gain international academic experience by offering short-term study abroad programs across disciplines and countries around the world. Facebook fans 129. Twitter followers 301. Honolulu, HI About Blog Keep up with Hawai‘i Pacific University’s students as they travel the world!- HPU International Exchange and Study Abroad Program creates memorable and transforming global learning opportunities that enrich career preparation and foster commitments to global citizenship. Facebook fans 616. Twitter followers 241. India About Blog D-Vivid Consultancy are at the forefront of overseas education consultation. Providing vivid and professional guidance to individual student who want to succeed in USA before and after F1 visa. Facebook fans 655. Twitter followers n/a. About Blog At StudyDestinations.com our purpose is to help people find the best study destinations around the globe. Go Study! Go Abroad! Go Explore! StudyDestinations.com helps you find courses at the best schools and top universities around the world. Find courses at thousands of educational institutions. Facebook fans 2,563. Twitter followers n/a. About Blog This is study abroad, ACCENT style. Our community is far-reaching and dedicated to inspiring internationally focused intercultural experiences. This is forum for sharing these experiences with you. Facebook fans 625. Twitter followers n/a. Minneapolis, MN 55455 About Blog The Learning Abroad Center Blog focuses on the student perspective of studying abroad. All of the posts are written by students that have studied abroad, or are currently abroad. Facebook fans 2,774. Twitter followers 2,272. Facebook fans 316. Twitter followers 275. About Blog Blogs written by past Drexel study abroad participants. Facebook fans 1,845. Twitter followers n/a. Fayetteville, AR About Blog Blog by University of Arkansas. Founded in 1871 as a land-grant institution, the University of Arkansas is the flagship of the University of Arkansas System. Our 27,000 students represent all 50 states and more than 120 countries. The U of A has 10 colleges and schools offering more than 210 academic programs. The University of Arkansas is accredited by the Higher Learning Commission. Facebook fans n/a. Twitter followers 2,396. About Blog Feed of posts on WordPress.com tagged "study-abroad"
Mountain View, CA About Blog Comprehensive up-to-date coverage for study abroad, aggregated from news sources all over the world by Google News. Facebook fans n/a. Twitter followers 212,817. Riverdale, NY About Blog Read about the experiences our study abroad students are having on the Jaspers Abroad blog. Facebook fans 141. Twitter followers 392. United States & Canada About Blog Blog by University Language Services, a resource for students from college application to graduation and beyond. Facebook fans 936. Twitter followers 3,057. Manchester, NH About Blog A blog for students, by students. The Saint Anselm Blog is offered by Saint Anselm College, a nationally ranked, Benedictine Catholic, liberal arts college located in Manchester, New Hampshire. Facebook fans 12,502. Twitter followers 11,111. Annville, PA About Blog Blog by Lebanon Valley College located in Annville, Pa., just 15 minutes east of Hershey and 35 minutes east of Harrisburg. Philadelphia, Washington D.C. and Baltimore are all approximately two hours from LVC. The College is ranked as one of the top 10 regional four-year, private liberal arts colleges in the North. LVC has 1,608 students studying 40 majors. Facebook fans 11,610. Twitter followers 4,510. Online, across America About Blog The first and leading study abroad review website. Abroad101’s mission is to promote global citizenship by fostering the most meaningful study abroad experience for all students through technology innovation. Facebook fans 10,051. Twitter followers 13,317. About Blog Blog entries from Asia Exchange and its students. Asia Exchange enables students to take part in study abroad semesters and internships in Asia. Facebook fans 5,195. Twitter followers 270. Facebook fans 10,885. Twitter followers 2,406. About Blog For all the latest tips, advice and guidance about studying abroad, from choosing a location to getting a student visa. Facebook fans 263,022. Twitter followers 19,738. Abilene, TX About Blog Australian Catholic University(ACU) Students' Experiences Studying Abroad. ACU is a public university funded by the Australian Government and open to students and staff of all beliefs. Facebook fans 131,532. Twitter followers 5,686. About Blog The Frostfairs provides useful information, tips, hacks and other important updates to the students perusing their studies abroad. Carrying a desire to study abroad? Frostfairs follows the Inspirational, Motivational and Informational factors of study abroad. Facebook fans 919. Twitter followers 10,686. New York About Blog The Ultimate Study Abroad Guide. The best blog for tips and advice on how to move abroad. Facebook fans 6,152. Twitter followers 733. India About Blog Blog by ReachIvy, a premium education consulting firm that guides students to get accepted into top educational institutions abroad. We offer career consulting services & free online resources. Facebook fans 15,566. Twitter followers 367. About Blog Experience the World of Education and Travel. Studyandgoabroad.com is the ‘go to’ site for students, primarily in Canada, who are researching options for further studies abroad, or considering a volunteer program, learning a language, working abroad or taking an international internship. Facebook fans 5,871. Twitter followers 2,588. Fayetteville, AR About Blog Opinions on studying abroad by U of A Honors College Blog. Founded in 1871 as a land-grant institution, the University of Arkansas is the flagship of the University of Arkansas System. Our 27,000 students represent all 50 states and more than 120 countries. The U of A has 10 colleges and schools offering more than 210 academic programs. Facebook fans 82,890. Twitter followers 6,120. Facebook fans 8,576. Twitter followers 1,096. Pinellas County, Florida About Blog Study Abroad blog by St. Petersburg College. From the beginning, St. Petersburg College has been a leader. It was Florida’s first two-year college (founded in 1927) as well as the state’s first community college to offer bachelor's degrees (2002). Facebook fans 26,173. Twitter followers 4,170. New York City About Blog The StudyPortals League of Students is a strong community of international student ambassadors. Our aim is to make the step of going abroad a little less scary by giving you better insights based on other students’ experiences. StudyPortals strongly believes that studying abroad enriches every person, creating more understanding for different cultures, norms and values. Facebook fans 47,764. Twitter followers 2,370. Beirut-Muscat... About Blog Check out the latest Study Abroad news, and tips from the number one study abroad agency in Lebanon! Studypedia Study Abroad Services Lebanon, is an education counseling center that helps students apply and study abroad. Facebook fans 8,293. Twitter followers 180. About Blog CEA Study Abroad Student Blog. We provide quality study abroad programs to U.S. and Canadian students around the world, designed to meet the varied and diverse needs of today's globally minded college students. Share your planning updates, your adventures onsite & your alumni memories. Facebook fans 35,912. Twitter followers 13,397. Jalandhar About Blog Study abroad consultant providing admissions assistance to Indian students.Head office in Jalandhar and branches are in Chandigarh, Mohali and Amritsar. Facebook fans 1,624,039. Twitter followers n/a. San Diego, CA About Blog This is a space to share our students’ experiences in the various projects promoted abroad and to create awareness of the numerous international events happening at the University of San Diego every week. Facebook fans 41,389. Twitter followers 11,362. New Paltz, NY About Blog Study Abroad Blogs by State University of New York at New Paltz, committed to providing high quality, affordable education to students from all social and economic backgrounds. Facebook fans 30,160. Twitter followers 7,409. Washington, DC About Blog The Georgetown University Office of Global Education (OGE) created this website to provide students with a forum to share their international experiences, and to promote communication between students currently abroad and the larger Georgetown community. Facebook fans 348. Twitter followers 1,442. About Blog Blog by Abroad Education Consultants, pioneer in the field of Global Education from last 8 years and has successfully sent more than 2000 students to universities and colleges around the globe. Facebook fans 9,168. Twitter followers 49. New Delhi, India About Blog Study Smart Blog. Study Smart is an overseas education consultancy with study abroad consultants in there offices in Pune, Delhi, Gurgaon and London, who offer admissions in top universities. Facebook fans 25,998. Twitter followers 179. Maryville, MO About Blog Blog by Northwest Missouri State University. Northwest Missouri State University, est. 1905 has more than 7,200 students and offers 124 programs of study. Facebook fans 165,192. Twitter followers 13,112. Costa Rica About Blog Our students' view on their study abroad experience! Facebook fans 4,073. Twitter followers 243. About Blog Your official starting point for studying in Holland, a small country with big opportunities. Facebook fans 120,517. Twitter followers 6,503. University of Reading About Blog Read about your fellow Reading student’s experiences abroad and see why studying abroad could be the most fun you could have at university as well as potentially enhancing your future career prospects and options also. Facebook fans 2,096. Twitter followers 621. Portland, ME About Blog Find out what it's like to study abroad in Spain with CIEE. Learn about life studying abroad in Barcelona, Spain. Facebook fans 59,442. Twitter followers 9,825. Russellville, AR About Blog Blog by Arankas Tech University, a state-supported institution of higher education, is dedicated to nurturing scholastic development, integrity, and professionalism. Facebook fans 23,638. Twitter followers 10,945. Milwaukee, WI About Blog Stories from Marquette University Students experiencing life around the globe through study abroad. Facebook fans 1,671. Twitter followers 885. Washington, D.C. About Blog GW Office for Study Abroad Blog is created to share the experiences of some of our study abroad students. Duluth, MN About Blog Learn about St. Scholastica through the experiences of current students. Facebook fans 11,516. Twitter followers 4,679.
International About Blog A blog for information, advice, updates and thoughts on funding an international education -- for international students that want to study in the US, as well as US students that want to study abroad. Facebook fans 68,377. Twitter followers 14,762. Facebook fans 4,588. Twitter followers 494. Vashi, Navi Mumbai About Blog Overseas education consultants in Mumbai for that students who take the right decision when making up their minds to study outside India. About Blog Blog by Natalie. With this blog I hope to give an honest depiction of life in Norway as a foreigner, and share fun stories about the friends I meet and things I learn along the way. When not in studying, I can be found spending time in nature, working with horses, or playing the violin. I love traveling, writing, and meeting new people. About Blog An ongoing look into the abroad experiences of Rhodes College students. CONGRATULATIONS to every blogger that has made this Top Study Abroad blogs list! 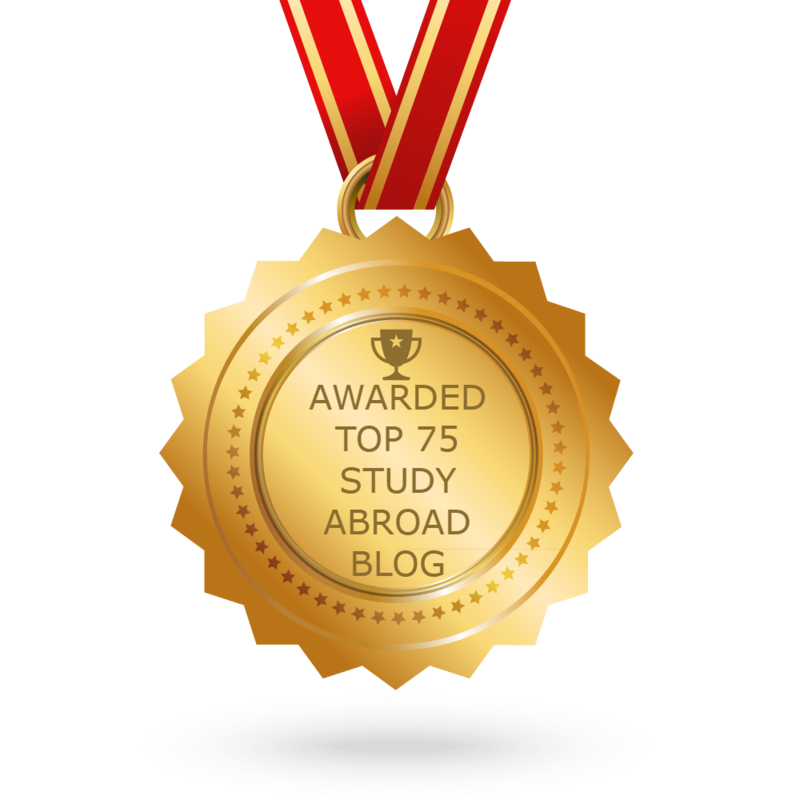 This is the most comprehensive list of best Study Abroad blogs on the internet and I’m honoured to have you as part of this! I personally give you a high-five and want to thank you for your contribution to this world.